as Parish Minister to St. Cecilia Parish, effective August 1, 2002. 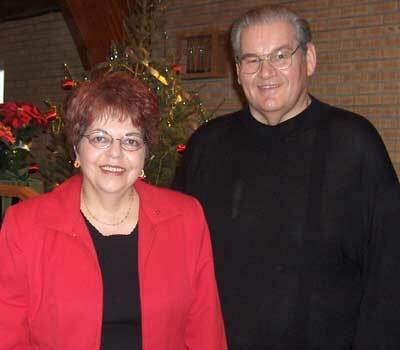 This is Len and his wife, Carol Van De Woestyne at St. Cecilia Church, Christmas 2005. Len retired from education after over 30 years as a teacher and guidance counsellor. He taught at Catholic schools in Moose Jaw, Melville and Estevan. He finished teaching in 2002 at Weyburn Comprehensive High School. Len is originally from Tribune, Saskatchewan. He has a B.A. (Philosophy, Theology) from Campion College and an Education degree from the University of Regina. He completed his professional guidance degree (P.G.D., Ed. Psych) from the College of Education in Regina. Len taught sacramental preparation and Christian Ethics in Saskatchewan schools. He has extensive experience in lay ministry with the parishes where he has lived. Carol has worked as a legal assistant in Weyburn and Regina. She has also worked extensively in church office administration (St. John the Baptist, Estevan). Carol is a musician and has been involved in music ministry for over 30 years. She sings, plays guitar, piano and organ. She directed the Weyburn community choir (Variations) for six years. She is currently studying at the University of Regina (Pastoral Studies). She and Len are also one of the music groups at St. Cecilia Church for weekend masses. Len and Carol have three children (in Brandon, Red Deer and Weyburn) and eight grandchildren. Effective July 31, 2008 Len has resigned his position as Parish Minister at St. Cecilia. He and Carol are moving to Manitoba to be close to family.